When it comes to designing a custom kitchen, there are plenty of things to consider. When it comes to designing a custom kitchen, there are plenty of things to consider. After all, the kitchen is considered the heart of the home. It’s one of the rooms where many families spend most of their time, and it’s an essential consideration for potential future homebuyers. But designing your custom kitchen doesn’t have to be overwhelming. 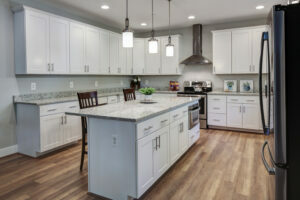 By setting out a plan for your custom kitchen project, keeping up with kitchen design trends, and relying on the right custom home builder, you can create your dream kitchen in Crofton. Here are some of our tips for designing your custom kitchen. Storage is vital in any home, and with a custom home builder, you can be sure your custom kitchen will meet all of your storage needs. Design a place for everything, from large cabinets, pantries for food, and smart storage solutions fitted perfectly to your floor plan and appliances. You can make the most of your custom kitchen by maximizing your storage solutions in your Crofton custom home. Other ways of utilizing clever design in your custom kitchen include concealed appliances. If you want to create a sleek, modern look in your kitchen, or want to make the most of counter and shelving space, consider microwave drawers that blend your microwave into your island or cabinetry. You can even create a sleek illusion with a refrigerator door that blends into your cabinetry. This is an especially great option for open concept kitchen design since it will help your design stay cohesive throughout the space. Accent pieces are a great way to add visual interest to your custom kitchen. Bold hardware is a great way to draw the eye to your kitchen cabinetry, but why stop there? Consider using bold lighting fixtures to truly bring your style into the kitchen from floor to ceiling. Hardware with an interesting shape or bold color can set your custom kitchen apart and complement other accent pieces. Add to a cohesive design plan with cabinet hardware that compliments a bold lighting fixture. Cedar Square Homes provides a variety of services to our customers, including custom home building to match your needs. We are trusted throughout Maryland for our excellent service and affordable home remodeling prices. Some of the areas we serve throughout the state include Anne Arundel County, Annapolis, Crofton, Severna Park, and Pasadena. Wherever you live, you won’t regret contacting us online or giving us a call at 410-987-9771. To see more examples of our work and stay up to date on our promotions, follow us on social media on Facebook, Twitter, and Pinterest.